From champion shearing to mutton bustin' to stock dog trials, the All American Sheep Day held during the Black Hills Stock Show offers interesting, educaitonal and entertaining events. RAPID CITY, SD – It’s among the most unsung ag industries in South Dakota. Yet it holds a very prominent spot when it comes to volume in the industry it represents as a whole – the sheep industry. 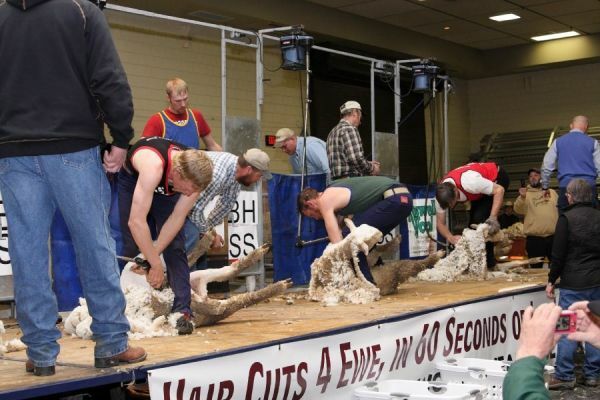 At Black Hills Stock Show, the single day devoted to sheep is filled with activities that start at 6:30 in the morning and don’t stop until 9:00 at night. Within those times are activities, events, and culinary delights for all ages and interests. That’s right. You don’t need to be a sheep producer to spend a fun day at Sheep Day, says Dave Ollila, a sheep field specialist. “It’s very significant to our agricultural economy. Yet the sheep industry is very unrecognized and unsung,” says Ollila. “And that’s the nature of people who raise sheep. You don’t see them putting on the airs like some folks do in other commodities. Set for Thursday, January 31, 2019 at the Kjerstad Event Center on the fairgrounds in Rapid City, you can take in the North American Sheep Dog Trials, the National Sheep Sheariing Contest, lamb euro’s for lunch or supper, the Spinner’s Circle, Mutton Bustin’ for the little tykes, the advancing technology of fiber optics in determining wool quality, and the National Wool Handlers Championship. “Sorting and classing wool -it’s a textile fiber like cotton- better you can keep that clean and classed to its imilar qualities, the better the product it will be,” says Ollila. Throughout the day, attendees to Sheep Day events can watch the skill of dogs and handlers, learn more about what it takes to shear and handle wool, and enjoy free classes, says Ollila. From sheep to shelf is how to best describe all of what’s offered during Sheep Day. Retailers will be there with wool and lamb products for the general public as will sheep industry businesses and representatives, catering more to the producer. Lamb is on the menu for concessionaire’s serving up delicious food and there’s room to roam for family and friends alike. “We’ll have a number of educational things going on that the public will enjoy and will be of interest,” says Ollila. It’s a day of fun, learning, and giving to others that all ages and interests can enjoy and take an active part in. It’s Sheep Day, Thursday, Feb. 1, 2018 at the Kjerstad Event Center on the fairgrounds during the Black Hills Stock Show in Rapid City, SD.